Whether you are a social justice leader in your congregation, or simply a UU concerned about justice and equity in your community and the world, you’ll be interested in reviewing the start-of-the-church-year email bulletin just released by the UUA’s Office of Congregational Advocacy & Witness. Click to view the UUA “JustAct” News Bulletin for August 2013. The bulletin offers “12 Ways to Support Your Justice Ministry in the New Church Year.” If your congregation or cluster’s social justice ministry is focused on partnerships for economic, environmental, racial, reproductive justice and/or LGBTQ equality there are resources for you: Videos, powerpoint presentations, webinars, study guides and more. The UUA Multicultural Ministries and Witness Team, including our Standing on the Side of Love Team, can help you connect with partners and funding too. They are looking forward to supporting your justice work in the coming year! You can start by joining in the new UUA Common Read: Behind the Kitchen Door. The book reveals how restaurant workers live on some of the lowest wages in America and how poor working conditions—discriminatory labor practices, exploitation, and unsanitary kitchens—affect the meals that arrive at our restaurant tables. The author explores the political, economic, and moral implications of dining out. Learn more. 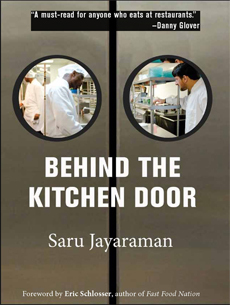 Behind the Kitchen Door is available from the UUA Bookstore. A UUA Study Guide will be available and posted on the UUA Common Read and economic justice pages by Oct. 1st. There are several “Justice Action News Lists” maintained by the UUA. To subscribe, click here.